Strange Items you find on the beach! The beaches in Southwest Florida are a wonderland for the ardent sheller and also for the novice just discovering this fascinating hobby. As a visitor to our area, you are in the enviable position of being able to simply stroll down our shell-filled beaches with the purpose of picking up a few souvenirs of your own. Our shelling tours offer you the best of area shelling and all the usual wealth of shells can be found at any given time. Our guides will be happy to inform you about all of our local shells and will help you identify any that you may discover during your time on the sand. 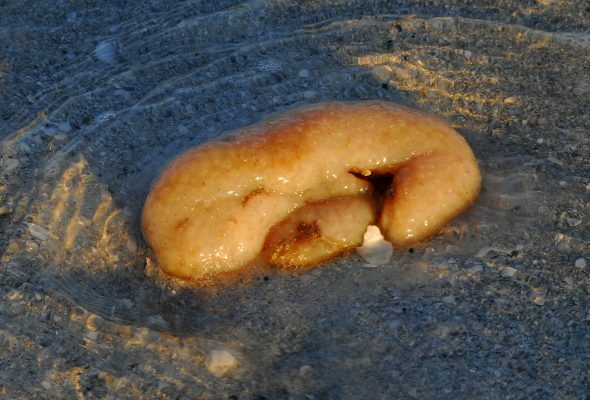 You may encounter a glistening blob in different colors that resembles a brain or an internal organ of a fish or sea mammal, but it can also be Sea Pork. Sea Pork is a simple organism that lives in the tidal areas and serves as food for fish sharks and skates. As they wash up on shore, these creatures die and litter the shores of our beaches. Another oddity that has people initially stumped is the lightning whelk egg casings. This resembles a long segmented cream colored snake of some sort, but is in reality, the leftovers of this creature’s reproduction. Skate egg casings are also an item that gives you pause for thought. Very light weight, black and shiny with that odd shape you wonder what kind of creature came out of it. There are large and smaller sizes, but all can be found on our shores. The beauty of a shelling tour is that every tour leads to new discoveries. If you find something interesting during your tour, please inform your guide so we can share your discovery with everyone!